How was your weekend? Quick again? Mine was. I got my hair done this weekend...it's pretty different, I'll post pics soon. I had it darked to a brown with caramel highlights and got myself a bang. I think the stylist cut off a little too much length but it should grow out soon. Anywho, on to the post! Recently I had the opportunity to try out some products from a brand new mineral makeup company Earthen Glow Minerals. I was also happy to hear that they are based out of Duluth, GA...not even 30 minutes away from where I live. They told me to peruse the website and pick what I liked. If you go to the website you'll notice that they have a crazy amount of products and colors. The eyeshadows are absolutely gorgeous! It was very difficult for me to to narrow down what I wanted to try! First off, there are over 116 shades to try. What first caught my eye were the colors...they have a gorgeous range of colors grouped by color families to help make it a little easier. 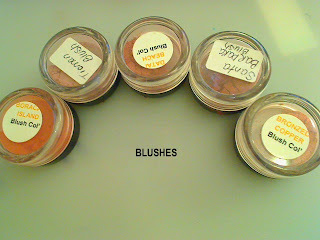 I received samples of these shadows and they are just as pigmented in person as they appear on the website. The only thing you should be aware of is that these shadows come loose in a jar. On the website they show the color as if it is a pressed mineralized eyeshadow in dome form, but this is not how you will receive them. Gorgeous! Definitely recommend. Their blushes venture away from the typical coral, peach an plum colors and also ventury into more browns and tawny shades. This company really makes an effort to reach out to various tones outside of the norm which is especially good for women of color. I really really wanted to like these. First off, foundations come in over 163 colors. The shades are named by different female names and each description of the shade offers a celebrity to compare the shade to. 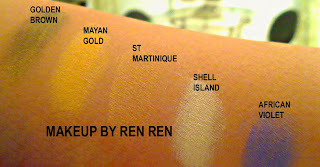 For example, the shade Robin is a brown foundation with yellow undertones. They list Tia and Tamara Mowry and Halle Barry as examples. I ordered a bunch of shades, from light to dark. When I tested them I was so disappointed. Upon swatching they powders all felt uber chalky, almost rough. I'm not a regular loose mineral makeup user so I pulled out a couple of mineral foundations for reference (bare essentials and everyday minerals) and they indeed were super chalky. The other foundations had a fine milled, silky texture. I wouldn't even want to put EG minerals foundation on my face. I was excited to try these out because again they seemed like they had a great range of shades. The company appeals to women of various ethnicities and the colors show this. I squeezed the lip gloss out and again was so disappointed. The gloss seemed to have big particles which made it seem like the product wasn't mixed together properly. It felt like huge chunks of dirt were in there. I'd much rather use this as a foot exfoliant than a lip gloss. I was really excited to try these because I just love anything that comes in a palette. The mineral lip cream palette comes with a whopping 15 colors. 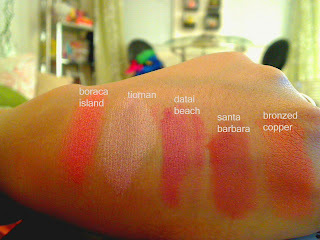 When I saw it in person I swatched the colors and why did each one come out looking like the same sheer reddish tone? It also smelt like cough syrup. The lipgloss palette was even worse. The product was not soft like gloss and swatched extremely clear. Putting them on the lips was not fun either. They stung my lips like no other! I’m thinking that whatever was causing the cough syrup smell was also burning my lips. Please don’t order these. Here's a look I did with the shadows. In person it looked better because you could see the color dimension more. In sum, I have mixed feelings. The company has some really great eyeshadows and blushes so you should definitely check those out. I would load up on the $.75 sample baggies. As for the foundations and lip products, I'm thinking that this start up hasn't quite ironed out the formulation process. My review of course, is my own personal opinion. 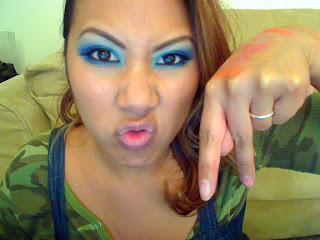 With that said, check them out http://www.egmineralmakeup.com/. hey ren! thanks for the introduction to egmineral collection of e/s. im amazed by the site SOOO MANYYY COLORS! ive actuallly been on this site for over an hours and im no where near goin to check out haha anyways i love your new hair do & the colors you did with ur eyes for this entry. you are very talented! thanks! I LOOOOOOOOOOOOVE that blue on you... I've been wanting to try that color for awhile now but didn't know how to do it.. I think I'm gonna try this one out- And the prices don't hurt at all either!! YAAAAY! Thanx Ren! 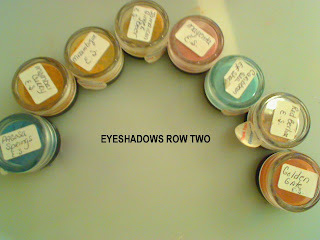 Hi there-a great review, I really like the eyshadow colours, very vibrant and reasonably priced! you look great!! blue looks amazing on you, loove the hair too!! 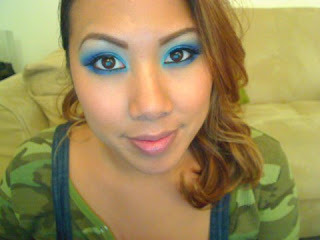 thanks for the honest review ren ren :) your eyeshadow is gorgeous! aww thanks for the sweet comment ren! yea seriously we're like our own critics sometimes... how do u get ur e/s to stay on sOoo dark n pigmented.. wen i try it on my hands.. its so pigmented but wen its on my eyes.. so light... im soo jealous of most of u bloggers! 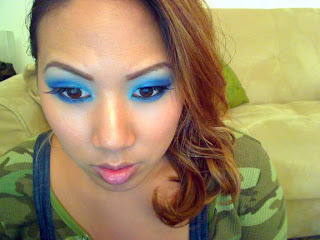 look at this blue on u...... HOTNESS! I absolutely love how pigmented the colors are!! Your eye makeup is GORGEOUS!!!! you always pull off the prettiest looks!!!!!!!!!!!!! !